"A lot of ethnic recipes use pig tails. 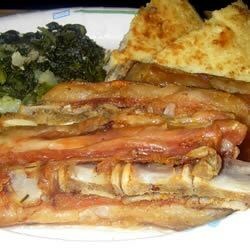 They are great as a meat dish with turnip greens, black-eyed peas, or boiled cabbage. My recipe cooks the tails, twice and the result is a crispy crackling covering the tail, that you can eat or save for crackling in cornbread. The crushed red pepper can be used liberally for a spicy taste. Be sure to buy pig tails that have a lot of meat around the upper part." Place the pig tails in a large stock pot, and fill with enough water to cover. Cover the pot, and bring to a boil. Boil for 10 to 15 minutes. Drain, and clean the pot of any debris, then return the tails to the pot and cover with cold water. Bring to a boil again, and season with onion, red pepper flakes and salt. Boil for about 2 hours, or until the tails are almost falling apart. Preheat the oven to 375 degrees F (190 degrees C). Line a roasting pan with aluminum foil. Drain the pig tails, and place them on the roasting pan. The stock from the tails may be used to cook turnip greens, cabbage or black-eye peas. Roast the tails for 30 to 40 minutes, until the tails pop and sizzle and the skin browns. Take care when opening the oven door. Allow the tails to cool, and serve with your favorite side dishes. See how to make incredibly succulent Hawaiian-style pork. Great idea, I'm from the Caribbean and we stop at the boiling part, this is an awesome recipe there should be more recipes like this.